Guardian can be added to a Web Cache Communication Protocol (WCCP) cache engine cluster. When enabled, Guardian broadcasts its availability to a nominated WCCP-compatible router. The WCCP-compatible router can forward web traffic and perform load balancing across all the WCCP capable proxies it is aware of. Both HTTP and HTTPS traffic can be transparently proxied via WCCP. Note: WCCP-compatible routers forward web traffic in a transparent mode over a GRE tunnel, therefore you must configure a transparent authentication policy for the interface which will receive redirected traffic. For information about transparent authentication policies, see Transparent Authentication Policies. 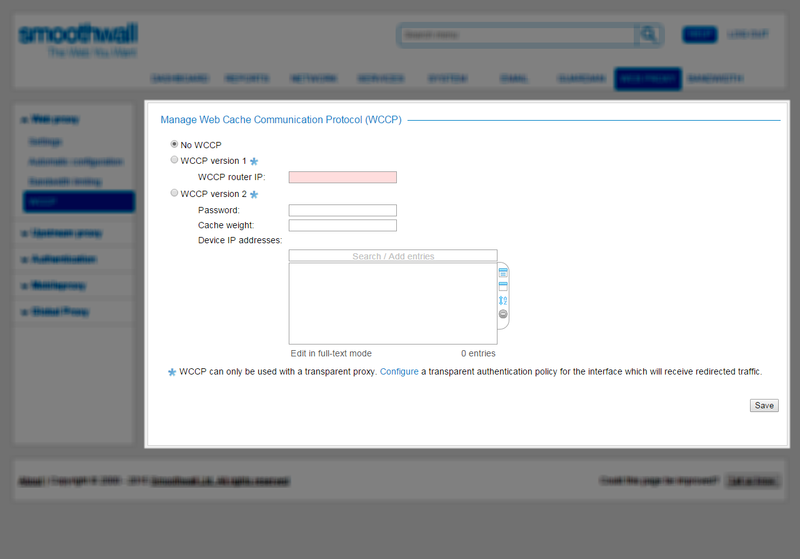 For more information about configuring WCCP on your router, refer to the documentation that accompanies your router. 1. Go to the Web proxy > Web proxy > WCCP page. • No WCCP — Select to disable WCCP. • WCCP version 1 — Select this option to enable WCCP version 1. Version 1 does not require authentication for caches to join the cluster, and only supports a single coordinating router. Enter the WCCP router’s IP address in WCCP router IP. • WCCP version 2 — Select this option to enable WCCP version 2. Version 2 can be more secure than version 1, as it supports authentication for caches to join the cluster, providing a level of protection against rogue proxies on the LAN. In addition, it supports multiple coordinating routers. Currently, WCCP version 2 in Guardian only supports routers configured to use the hash assignment method and GRE for both the forwarding and return methods. Enter the password required to join the WCCP cluster. WCCP passwords can be a maximum of 8 characters. Enter a cache weight to provide a hint as to the proportion of traffic which will be forwarded to this particular cache. Caches with high weights relative to other caches in the cluster will receive more redirected requests. Enter the IP addresses of one or more WCCP version 2 routers. 4. On the Web proxy > Authentication > Manage policies page, create a transparent authentication policy using the authentication method you require and select WCCP as the interface. For more information, see Transparent Authentication Policies. Guardian completes the WCCP configuration.